Top Recipes of 2017 | The Food Hussy! Yesterday I shared the best restaurant dishes of 2017 and today I'm going to share with you the best recipes I made in 2017 and the most popular ones from my site - in case you missed them! 1. Blueberry Vinaigrette - super simple recipe and it's always fun to spend time with my TV friends. 2. Cheesy Irish Boxty's - these are great for St. Patrick's Day but shouldn't be missed the rest of the year either! 3. Strawberry Cacao Pork Loin Salad - I love this salad at Bite Restaurant in Milford and decided to make it at home and then added a bacon covered pork loin. How can you go wrong? 4. Praline Caramel Corn - uh yes please! Do I need to say any more? 5. 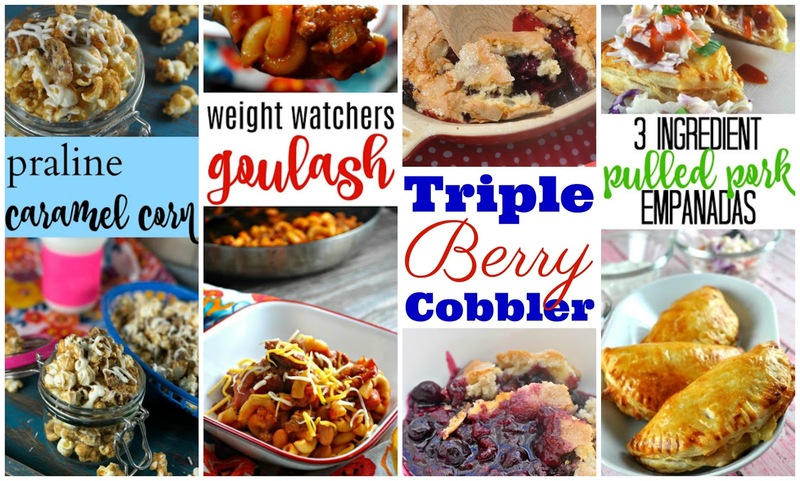 Triple Berry Cobbler - this is by far my favorite recipe of the year. It's my Mom's Famous Cobbler recipe with mixed berries swapped out for the normal peaches. It's soooo good! 6. Ham + Noodle Casserole - I've made this recipe since I could reach the counter as a little kid. It's delicious and simple. Canned ham is the surprise and it's definitely something you'll use again! 7. 3 Ingredient Pulled Pork Empanadas - These are great tasting and on the table in less than 30 minutes! So it's a win! win! Now - the top 5 recipes across my site for the year! There are some delicious favorites in here!!! 6. Weight Watchers Goulash - I grew up making goulash and here's a healthy version that is still packed with flavor. It's a perfect winter recipe for these cold cold days and the leftovers are delicious! 5. CopyCat Penn Station - Meijer sells the perfect beef for copycat Penn Station sandwiches and it's a staple in our house - we make them all the time! 4. CopyCat Maid Rites - Maid Rites are my favorite food from back home and so many of them have closed so I had to figure out how to make them myself and I did! Yahoo!!!! 3. One Pot Cheesy Sausage Pasta - You can't go wrong with one pot meals - and this is one of my favorites! Cheesy and delicious! 2. CopyCat Taco John's Potato Ole Seasoning - another favorite from home! We don't have Taco John's here but this seasoning mix is something I still remembered and loved so I made it myself! 1. Mom's Peach Cobbler - still #1 - it'll always be my Mom's Peach Cobbler. There's a secret ingredient that you just can't match. If you haven't tried this one yet - I'm not sure what you're waiting for! It will hands-down be the best cobbler you've ever tasted!! So that's it for 2017! Hopefully some of the dishes I made this year will make the top list next year as well! Have you tried any of them? Let me know what you want me to make!